Six designs for the first new bridge across the River Avon in Bath in over a century have been unveiled. The proposals for the bridge were shortlisted from 50 entries in a competition launched by Bath and North East Somerset Council in February. The bridge will link Bath Quays with the city centre. The council said it was essential for the regeneration of the "neglected" quayside district. 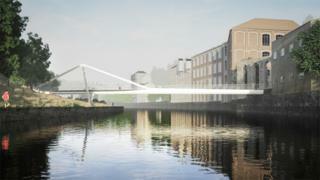 The winning design for the Bath Quays Bridge will be announced in November. Tim Warren, leader of the council, said: "A development of the scale of Bath Quays is a fantastic opportunity for Bath to reinvent a somewhat overlooked corner and connect it with the vibrant and beautiful historic city." Patrick Anketell-Jones, cabinet member for economic development, said it was a "game-changing development" for the city. "We want to gauge public opinion on the competition entries before we select the preferred design for what will become a major landmark in the city," he said. The designs for Bath Quays Bridge will be showcased at an exhibition to be held at the One Stop Shop on Manvers Street, Bath, from September 14 - 25. The designs will also be available to view online at bathnes.gov.uk.